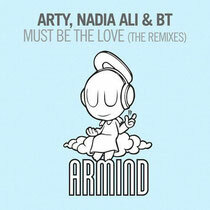 Finally out this week, Arty, Nadia Ali & BT's 'Must Be The Love' has been peaking the charts and rocking clubs and now it has a fresh set of remixes by upcoming talents Dannic, Au5 and Shogun. The track melted the beats of Russian talent Arty, the warm voice of award-winning singer Nadia Ali and the melodies of legendary producer BT. Part of the upcoming album, BT has made a grand musical promise by kicking off with this one. On the remix pack, he invites US based producers Shogun, Au5 and Dutchman Dannic. Shogun, who's built a steady reputation as one of the fastest rising names in trance land, gave the original a twist of deep prog-trance, riding a gentle piano break and lighting the emotional side of the beat-ballad. Dannic, also known as the guy behind Funkadelic, swept it up with a remix of pure energy, prog-house power and a contagious, rough edge. Au5 made a smooth prog-trance cross-over mix whitch flows and adds more feel to the track.